Richard Meier's luxury condos outside the Greenwich Village Historic District. “Is Landmarking Out of Control?” That was the question posed by Crain’s New York at a forum it hosted in mid-May. To answer that noticeably leading question, Crain’s invited some of the biggest names in the city’s preservation and development worlds to hash it over coffee and pastries at the New York Athletic Club in Midtown. On the other side of the debate were Peg Breen, the president of the New York Landmarks Conservancy and Ronda Wist, the vice president of preservation at the Municipal Art Society (MAS), who explained how historic districts create a vibrant, livable city that creates jobs, attracts tourists, and increases property values. This type of preservationist versus developer back-and-forth is not new—these battles have been waged over the streets of New York for years. But, now, as Mayor de Blasio sets out to build or preserve 200,000 units of affordable housing, the issue of landmarking—specifically, the designation of historic districts—has become a flashpoint in the debate over the city’s affordability crisis. So, when exactly, did the landmarking process supposedly get “out of control?” A quick look at the numbers shows it happened under Mayor Bloomberg. Yes, as glass towers were rising and megaprojects were being approved, “pro-development” Bloomberg was designating more historic districts than any mayor since the Landmarks Preservation Commission (LPC) was founded in 1965. According to the Wall Street Journal, Bloomberg added or extended 41 historic districts—topping Giuliani’s designations by 23 and Koch’s by 14. 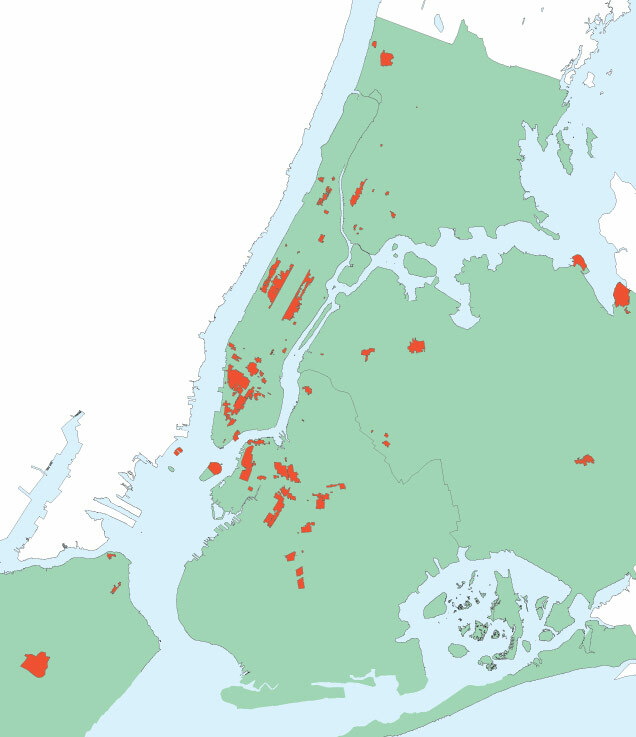 More than half of those designations were in outer boroughs. Map of New York City with historic districts in orange. Near the end of Bloomberg’s three terms, REBNY started issuing studies on the impact of all this landmarking. In July, the Board found that nearly 28 percent of Manhattan properties were landmarked; a subsequent press release declared: “Excessive Landmarking of Manhattan Properties Stifling Economic Growth.” To arrive at that figure, REBNY counted both historic districts and specific landmarked buildings in its calculation. Four months earlier, the Journal reported that historic districts, by themselves, only encompassed 10 percent of the island and two percent of the city overall. REBNY now puts that latter figure closer to four percent. In September, REBNY was out with another study; this time it claimed that no affordable units had been created on landmarked properties in the borough since 2008. “Landmarking Curtails Affordable Housing Development in Manhattan,” read the press release. And then in June—with a new mayor in town—the same argument. 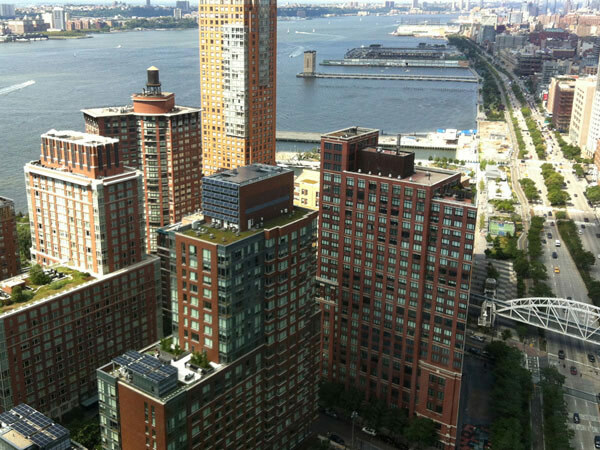 The latest study, which encompassed the entire city, found that only 0.29 percent of new affordable units built from 2003 to 2012 were on landmarked properties. Upper West Side/Central Park historic district. The plan, however, does not touch the issue of landmarking. In 115 pages, the word “landmark” only tangentially comes up in a footnote and in the glossary. And that is partially because the mayor is not targeting the West Village’s brownstones or Soho’s cobblestones to build his 80,000 new units of affordable housing. And the industrial and under-used areas he is eyeing to rezone for residential use are not being considered for historic designation. To achieve his ambitious goal within 10 years, de Blasio is launching a multipronged approach that also includes mandatory inclusionary zoning, raising taxes on vacant lots to encourage development, and reevaluating Bloomberg’s land lease plan to build on New York City Housing Authority property. The mayor has also been packing more affordable units into Bloomberg-era developments like the Domino Sugar Factory and Atlantic Yards. But even with these new, permanently affordable units—and the many more market-rate apartments slated to rise alongside them—New York City will still be a very expensive place to live in a decade’s time. The city cannot, and will not, stop building; most everyone agrees that freezing construction would only make matters worse. But there is plenty of debate about how much the city should build, where it should do so, and if supply can ever meet demand. 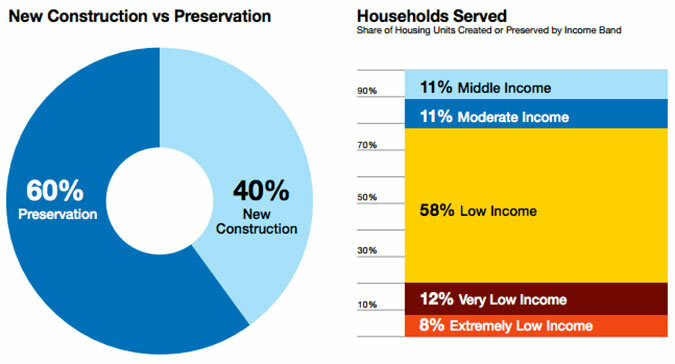 The bigger question, then, is: Can New York City build its way out of the affordability crisis? “It is impossible,” said Jaron Benjamin, the executive director of the Metropolitan Council on Housing, a housing advocacy group based in New York. “We do not have billions and billions of dollars to throw at this problem. We have to think creatively.” Benjamin supports new development, but wants the city and state to focus on ways to preserve the apartments that are currently affordable. And that is exactly what the mayor’s plan does. Because while de Blasio’s pledge to build new affordable units, and increase the city’s overall housing stock, has received the most attention, it gets him less than halfway to his goal of 200,000 units. The bigger piece of the plan is focused on preserving affordable units, about 120,000 of them. The details on how, exactly, he plans to do this are less clear, but the mayor’s office has said that city agencies will “use every tool at their disposal” to protect rent-stabilized units from being deregulated. Andrew Berman—the executive director of the Greenwich Village Society for Historic Preservation and one of REBNY’s most vocal critics—readily admits that landmarking is not the way, or even a way, to build new affordable units. But he believes that landmarking can be a tool to preserve rent-stabilized units that still exist in some of the most coveted zip codes in the world. “[Landmarking] can slow down the pushing out of long-term tenants and the disappearance of existing affordable housing because of anti-demolition protections,” said Berman. Unleashing development in, or around, historic districts, he said, would not necessarily lead to more affordable units; it could build a foundation for luxury condos that lift prices higher. 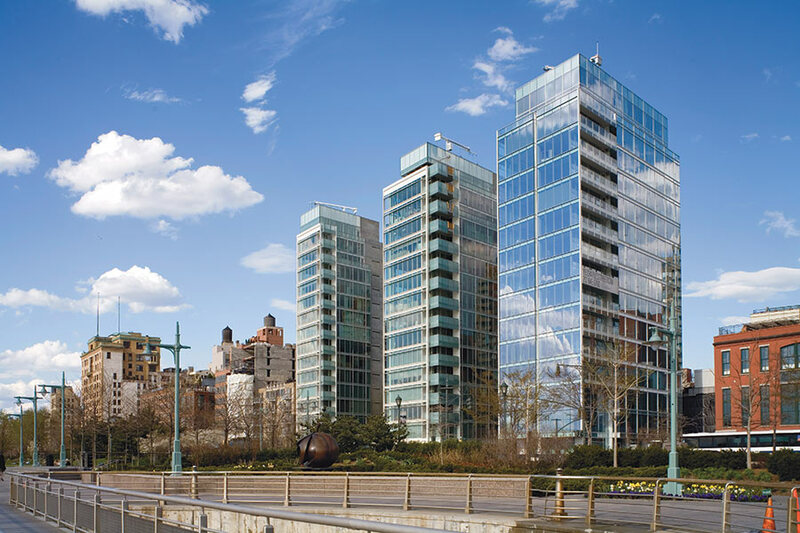 He points to the glass towers lining the Hudson River, just outside of the Greenwich Village historic district, as glossy examples. But in the debate over the future of landmarking, something resembling common ground starts to appear in terms of the process itself. The LPC’s approval procedures for new projects in historic districts—and renovations on landmarked properties—has been criticized by many for being too slow and overly expensive for property owners. Whether that will happen is entirely unknown—as are most aspects of landmarking under Mayor de Blasio. The big question hanging high above any concerns about process or funding is what’s next? 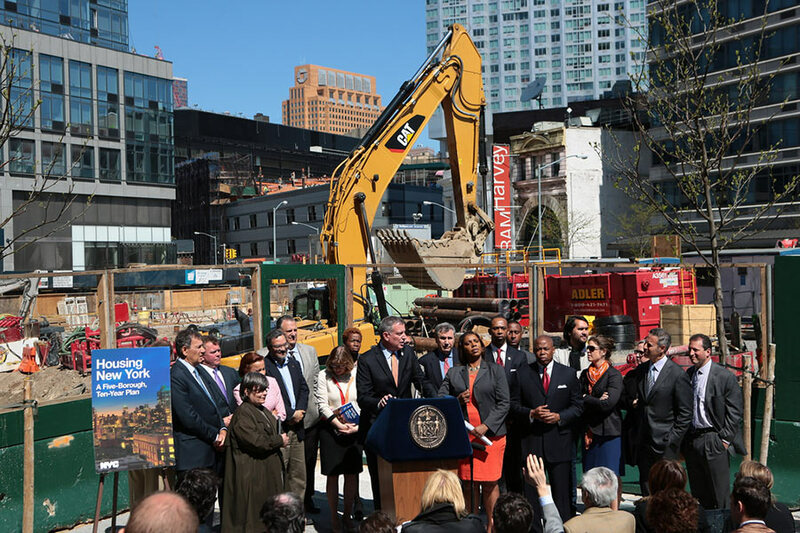 On preservation, will de Blasio be another Bloomberg? Six months into the mayor’s term, that remains a question neither side can answer. And de Blasio’s selection of Meenakshi Srinivasan to head the LPC provides few clues about the future of landmarks in New York City. The choice of the then-chair of the Board of Standards and Appeals surprised most onlookers when it was announced in May. 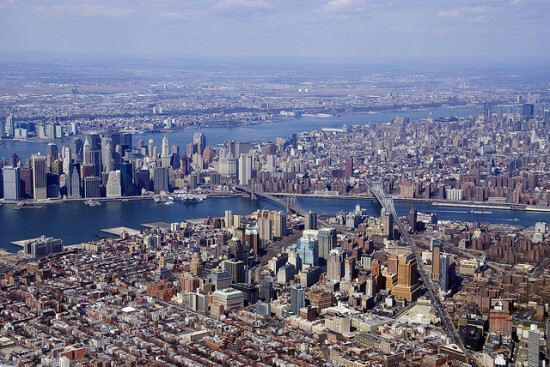 While landmarking is not expected to have an extensive impact in the affordable housing plan, in the coming months and years, the LPC could have a direct role in shaping New York City’s skyline. If the controversial Midtown East Rezoning plan is adopted, and taller towers head for the sky, the Commission will help decide the fate of the area’s older stock. It could also adopt a proposal from a group called “Iconplans,” which would upend the selling of air rights. As the Journal reported, the group’s plan allows non-profits, universities, and religious institutions to sell air rights above their landmarked properties to developers who could use them elsewhere in the city—likely places where they can build taller. Currently, those air rights can only be transferred to adjacent sites. The LPC told AN it would consider this type of proposal. 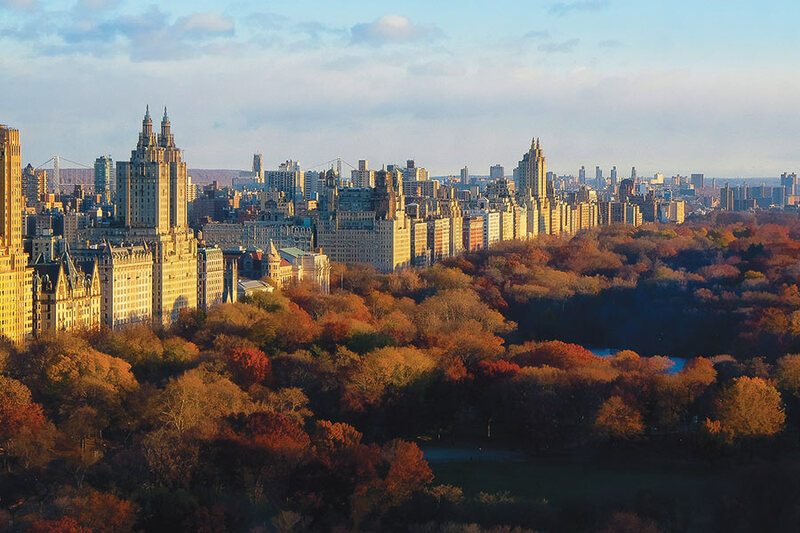 “As the administration continues to develop its housing and economic development policies, the expanded sale of air rights will be a relevant part of the discussion, which will occur across agencies,” said the LPC spokesperson. Its response could transform the city. As expected, one of the central pieces of de Blasio’s plan is “mandatory inclusionary zoning,” which will require developers to include below market-rate units at rezoned sites. Under Bloomberg, developers were incentivized—but not required—to make 20 percent of new projects affordable. While inclusionary zoning is a focal point of this plan, it is easy to overstate its impact. According to The New York Times, inclusionary zoning under Bloomberg—albeit voluntary—only created 2,800 affordable units since 2005. 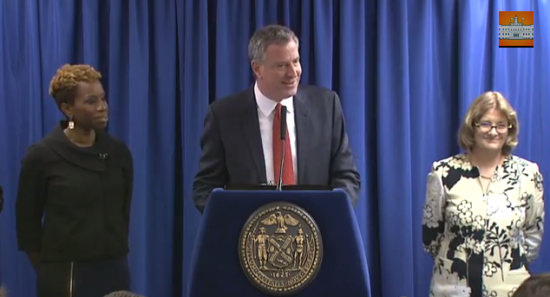 Mayor De Blasio delivers his first state of the city address. 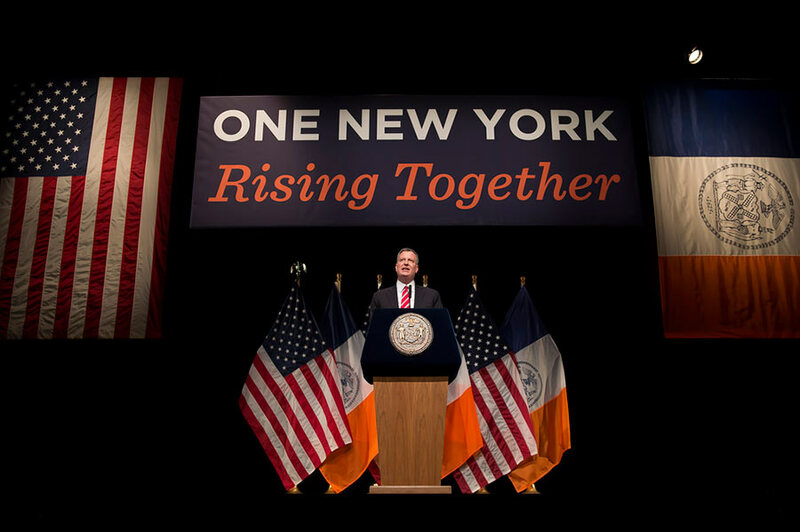 The difference between Michael Bloomberg’s final State of the City address and Bill de Blasio’s first was so vast it seems impossible the two were speaking about the same city. In the newly opened Barclays Center, then-mayor Bloomberg touted the booming development across New York—from the Atlantic Yards to the Hudson Yards. He referenced job opportunities, sustainability, and, of course, the bike-share program. One year later, at the LaGuardia Community College in Queens, Bill de Blasio spoke of “The Tale of Two Cities”—a town racked by inequality. He didn’t talk about any big, splashy developments, but pledged to help “New Yorkers crushed by skyrocketing rents.” There was no mention of transportation, climate change, or infrastructure—all considered bright spots in Bloomberg’s complicated legacy. But while Mayor de Blasio makes national headlines for his laser-like focus on tackling inequality, he has been appointing highly competent individuals to lead the city’s housing, transportation, environmental, and planning teams. All of these appointments, explained de Blasio, are not separate from the fight against inequality. They are central in waging it. In early February, de Blasio appointed Carl Weisbrod—a real estate industry veteran with experience in the private and public sector—to chair the city’s planning commission. Weisbrod is perhaps best known for his integral role in cleaning up Times Square in the 1980s and later helping to transform Downtown Manhattan into a mixed-use neighborhood. As planning commissioner, Weisbrod will be instrumental in accomplishing one of de Blasio’s key legislative goals: to “preserve or construct” 200,000 units of affordable housing over the next 10 years. He will be joined in that fight by the mayor’s new housing team. The mayor recently appointed Shola Olatoye—a former executive at an affordable housing non-profit—as chair of the New York City Housing Authority. The Department of Housing Preservation and Development’s new commissioner is Vicki Been, who was the former director of NYU’s Furman Center for Real Estate and Urban Policy. And Gary D. Rodney, from the affordable housing developer Omni New York, is the new president to the Housing Development Corporation. 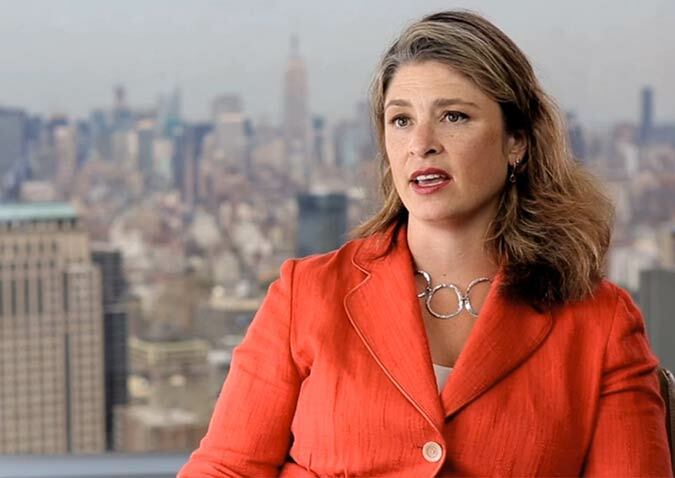 Alicia Glen—the former head of the Goldman Sachs’ Urban Investment Group—is the city’s new deputy mayor of housing and economic development. Even with a strong team beside him, de Blasio’s affordable housing goal will be exceptionally difficult to achieve. One tool de Blasio will likely use to hit his 200,000 figure will be “mandatory inclusionary zoning,” or requiring developers to include affordable housing units in new buildings. Under Bloomberg, developers were only incentivized to do so. And since it will not be enough to just “preserve” existing affordable units, the de Blasio years might see significant zoning changes to offer new development opportunities. The benefit of this could be twofold: more development would boost the number of new affordable housing units, and the housing stock overall. 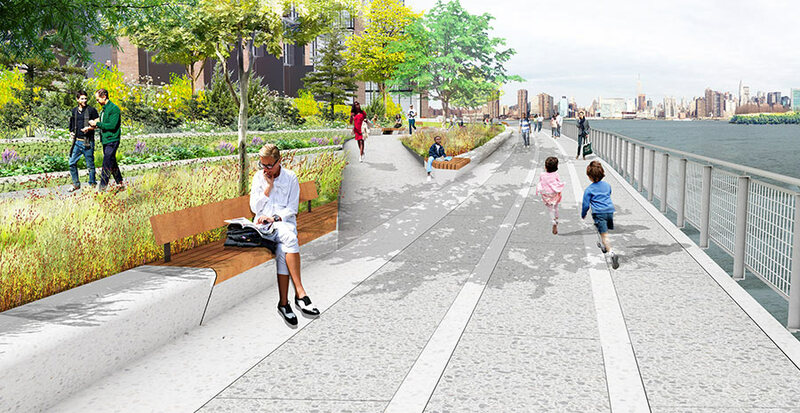 In terms of transportation and the city’s streetscape, the de Blasio administration is poised to build on Janette Sadik-Khan’s impressive legacy of transforming New York City streets. The mayor’s selection of Polly Trottenberg—the former under secretary for policy at the U.S. Department of Transportation—to lead the city’s DOT has been lauded by those championing safer streets and improved transportation. “The personnel positions, and particularly hiring Polly Trottenberg, look really good from street safety and livable streets perspective,” said Ben Fried, the editor-in-chief of Streetsblog. Trottenberg will be responsible for more than bike lanes and pedestrian plazas; she will work alongside the new police commissioner, Bill Bratton, to implement the mayor’s “Vision Zero Action Plan” to reduce pedestrian fatalities. It has become clear with these appointments that the mayor plans to use every department, and every new official, to address the city’s inequality. Combatting inequality is a daunting, if not impossible, fight to wage from City Hall, but the mayor and his team seem ready to at least throw some punches. Over the weekend, New York City Mayor Bill de Blasio announced four key appointments to his housing team. The mayor selected Shola Olatoye—a former vice president at the affordable housing non-profit Enterprise Community Partners—to chair the New York City Housing Authority (NYCHA). He also announced that Cecil House will stay on as the authority’s General Manager. Vicki Been, the director of NYU’s Furman Center for Real Estate and Urban Policy, will become commissioner of the city’s Department of Housing Preservation and Development. And Gary D. Rodney, an executive at the affordable housing developer Omni New York, will run the Housing Development Corporation. “We are going to take a new approach to this crisis that holds nothing back. From doing more to protect tenants in troubled buildings, to innovating new partnerships with the private sector, to forging a new relationship with our NYCHA communities,” said de Blasio in a press release. “Every decision we make will focus on maximizing the affordability of our neighborhoods.” This team—along with newly appointed City Planning Commissioner Carl Weisbrod—will be tasked with implementing de Blasio’s aggressive affordable housing agenda. The mayor has pledged to preserve or create 200,000 affordable housing units over the next decade. The proposal would improve connection and increase waterfront access in the Bronx. 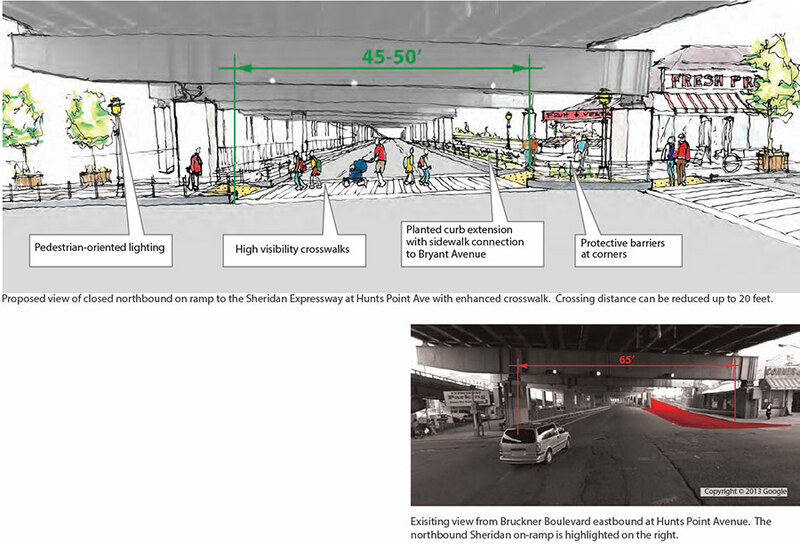 Only a few weeks before administrations changed hands at the mayor’s office, New York City released a comprehensive inter-agency report seeking to overhaul the Sheridan Expressway, the short but divisive freeway that cuts through the southern Bronx. This new study, which solidifies a number of recommendations introduced last spring, is part of a larger effort to reinvigorate a part of the borough that has been split apart by the unsightly expressway, creating perilous pedestrian crossings and exposing residents to hazardous air pollution. The scope of this report is more far-reaching than simply the revamping of the Sheridan. It also calls for rezoning to allow for mixed-use development, which the agency says will lead to an increase in jobs. Plan showing the segment of the Sheridan proposed to become a boulevard. City Planning (DCP) worked collaboratively with the New York City Department of Transportation, the Economic Development Corporation, and Housing Preservation and Development to put this study together, officially titled, "The Sheridan Expressway Study: Reconnecting the Neighborhoods Around the Sheridan Expressway and Improving Access to Hunts Point." The proposal not only requires inter-agency teamwork, but also necessitates extensive coordination between city and state. Since the highways are operated by the state, these recommendations must be vetted and ultimately carried out by the New York State Department of Transportation. The 1.5-mile Sheridan Expressway—a remnant of Robert Moses’ failed plan to create a link between the Triborough Bridge and the New England Thruway—generally operates substantially below capacity but is often used by trucks. 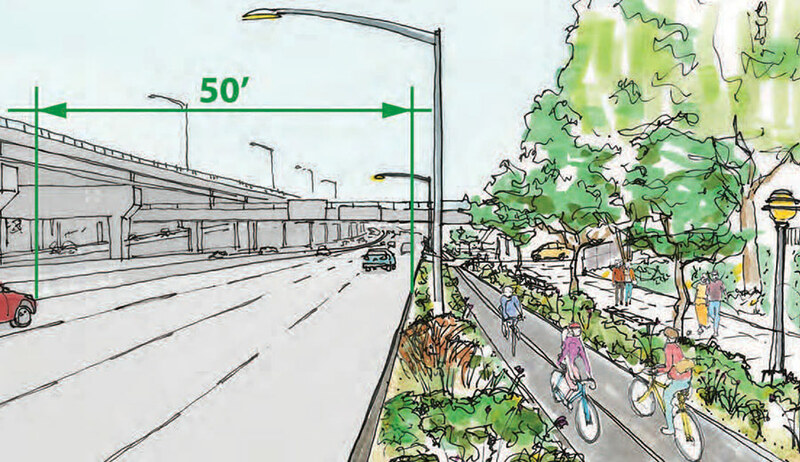 To relieve congestion and enhance the connection to the Greenway and Starlight and Concrete Plant parks for pedestrians, the city recommends rehabilitating the northern half of the expressway and turning it into a boulevard. 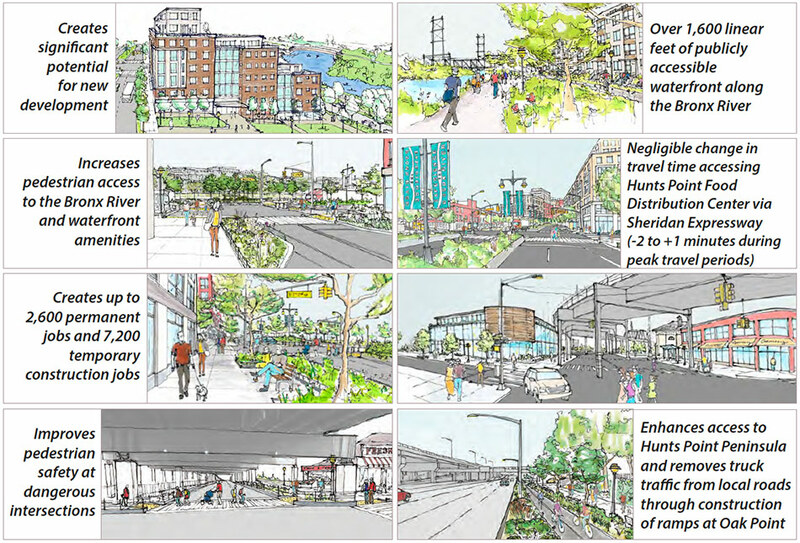 The plan entails three new crossings to establish a direct path to the waterfront and also adding ramps to enable trucks to reach the industrial corridor at Hunts Point more easily. 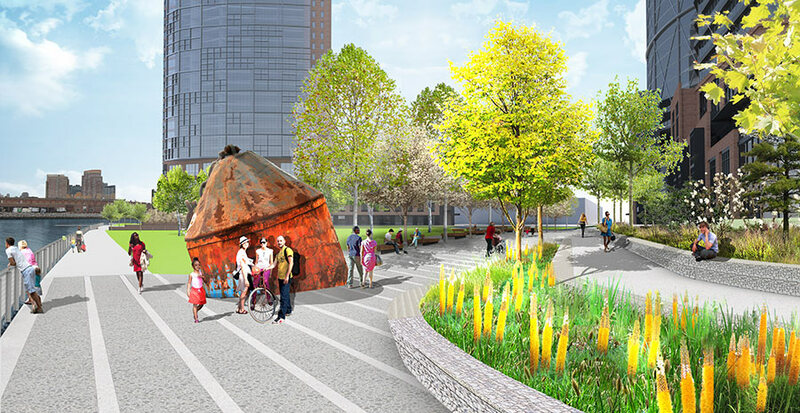 The city hopes that these improvements will set the ground work for the rezoning of the waterfront and attract new development, drawing more people back to the Bronx and righting a wrong from one of Moses’ most fractious urban renewal plans. Alicia Glen has been selected to serve as Deputy Mayor for Housing and Economic Development. In his inaugural speech Mayor Bill de Blasio repeatedly used the phrase “tale of two cities.” It remains to be seen how the new Mayor will reshape New York City as one, but his recent appointments suggest how his administration will steer the city forward. Prior to the New Year snowstorm, de Blasio had named several appointees to agencies that oversee the city’s built environment: Alicia Glen as Deputy Mayor for Housing and Economic Development; Polly Trottenberg as Commissioner of the Department of Transportation; and Kyle Kimball to continue as President of the New York City Economic Development Corporation (NYCEDC). “I'm very excited about these three appointments—their sophistication, and balanced perspectives... they each know how to get things done—and are each progressive and realize the city needs innovative approaches to ensure and enhance livability and resilience going forward,” wrote Vin Cipolla, President of the Municipal Art Society, in an email. For the past twelve years Glen headed the Urban Investment Group at Goldman Sachs, which committed over $2.8 billion in low-income development projects in cities throughout the country. She was also instrumental in raising over $40 million to help finance New York’s Citi Bike bicycle share program. From 1998 to 2002 Glen was the assistant commissioner for housing finance at the Department of Housing Preservation and Development under Mayor Rudolph W. Giuliani. A veteran of the Bloomberg administration, Kyle Kimball will continue as President of NYCEDC, a position he has held since August 2013. He has been with the organization since 2008 and has worked on the Applied Sciences NYC initiative, creating four new graduate science and engineering campuses. He has also been involved with outer-borough economic development projects, including the transformation of the Kingsbridge Armory in the Bronx. De Blasio has yet to fill a host of positions including commissioners of City Planning, Building, Design and Construction, Parks and Recreation, Landmarks Preservation, Cultural Affairs, Public Design, and Long-term Planning and Sustainability. In related news, Holly Leicht has been appointed to serve as Regional Administrator of the U.S. Department of Housing and Urban Development Region II, which comprises New York and New Jersey. Leicht, who was Executive Director of New Yorkers for Parks, will oversee ongoing Hurricane Sandy recovery efforts. 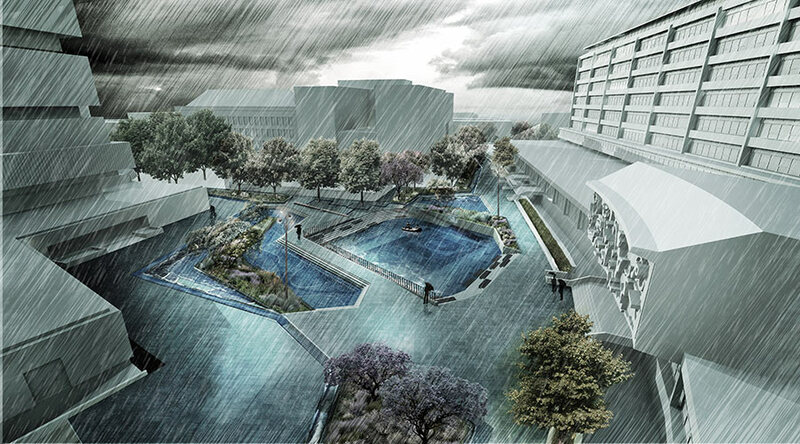 Sweden-based firm White Arkitekter has been named the winner of the "For a Resilient Rockaway" (FAR ROC) design competition. The team's winning proposal, Small Means & Great End, offers a set of design strategies to transform an empty swath of land, known as Averne East, along the Rockaways in Queens, New York into a resilient, mixed-use community. The New York City Department of Housing Preservation and Development (HPD), along with private developers and the AIA New York Chapter, shortlisted four finalists back in July, including Ennead Architects, Lateral Office, and Seeding Office. 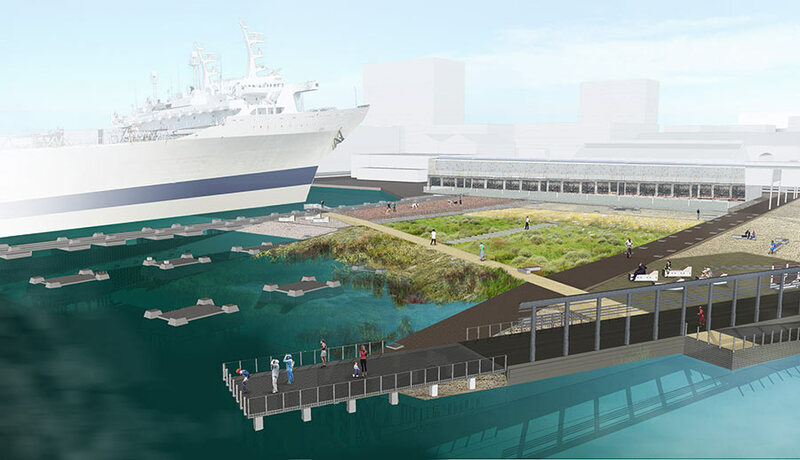 Ennead's design, "Fostering Resilient Ecological Development," was recognized by the jury for Leading Innovation in Resilient Waterfront Design for its diverse ecological design solutions. White Arkitekter, which has been granted a $30,000 prize to realize its plan for the 80-acre site, has proposed implementing "a series of small, affordable, and smart interventions," which aims to mitigate damage, provide improved access during a storm, and create what they call an "antifragile" environement that fares better during and after extreme weather conditions. 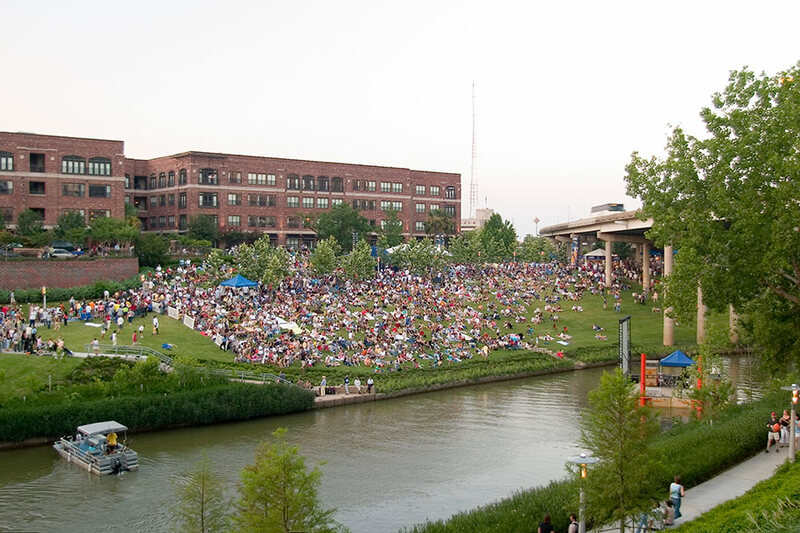 SWA Group's Buffalo Bayou Promenade created recreational areas along the waterway and incorporated flood mitigation infrastructure. New York was still pumping Sandy’s surge-water out of its subway system when news headlines began to trumpet how best to ride out the next big storm—“NYC Sea Barrier: Its Time Has Come” or “Saving New York by Going Green”—leaving the impression that infrastructure could be neatly categorized into opposite kinds: grey vs. green or hard vs. soft. The thread that bound everything together was the promise of a more “resilient” New York. But the menacing irony here is that these kinds of easy dualisms have a lot to do with getting us to our present state of vulnerability in the first place. When the U.S. looks like a schoolroom map—blue for water, green for land, Mississippi River as a winding line, and barrier islands stretching out along the coast—it seems perfectly reasonable to build public housing on the Rockaways, industrial parks along the Gulf Coast, and cities in the Mississippi delta. In reality, though, coastlines are not lines at all, but zones of negotiation between land and sea, barrier islands are on the move (briskly so, on geological terms), and the delta is an impossible-to-distinguish mixture of water and land and everything in between. The climate-related risks we now face don’t hew to any dualisms. Floodwaters overwhelm dykes and dunes alike. Tornados and wildfires are blindly indiscriminate. And heat waves are just that: waves that lack clear boundary in space and time. It follows, then, that the strategies used to render our communities resilient from these risks must also emerge from this kind of nuance. There are compelling guides in place. In On The Water: Palisade Bay, for example, pioneering research by structural engineer Guy Nordenson, with Catherine Seavitt, a landscape architect, and Adam Yarinsky, an architect, allowed the team to propose coastal planning strategies in the New York/New Jersey harbor that hybridized land and sea, hard and soft. Leaving aside the question about whether it is caused by humans, there can be no doubt that sea levels are rising and that extreme climate events are happening more intensively and more regularly, so cities around the U.S. are planning for these events. For Houston, which trails only New Orleans as the city with the most repetitive flood claims in the U.S., developing a resilient urban design is of paramount concern. There, the SWA Group designed a 23-acre park along what had been the neglected banks of Buffalo Bayou, and, in the process, created a zone where green and grey become indistinguishable. 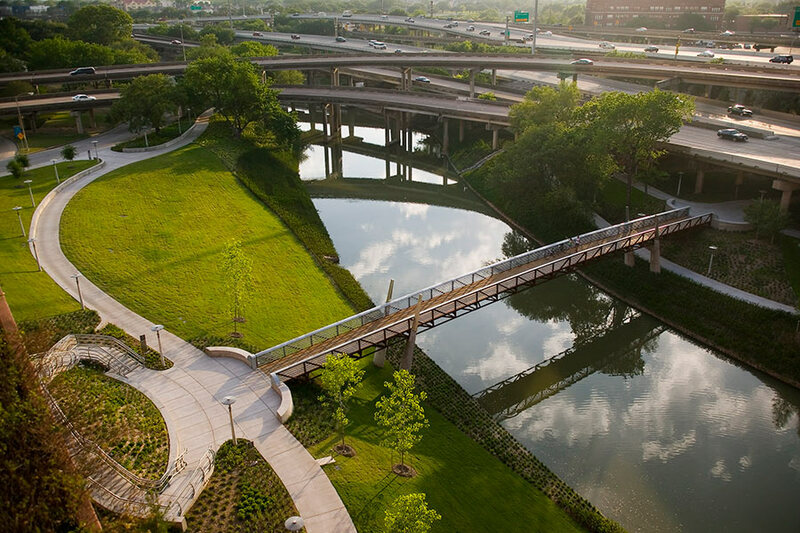 Built to withstand flooding and engineered to mitigate the collateral damage incurred by those natural events, its planted slopes weave the waterway back into the urban experience as a strip of recreational space at the center of Houston. 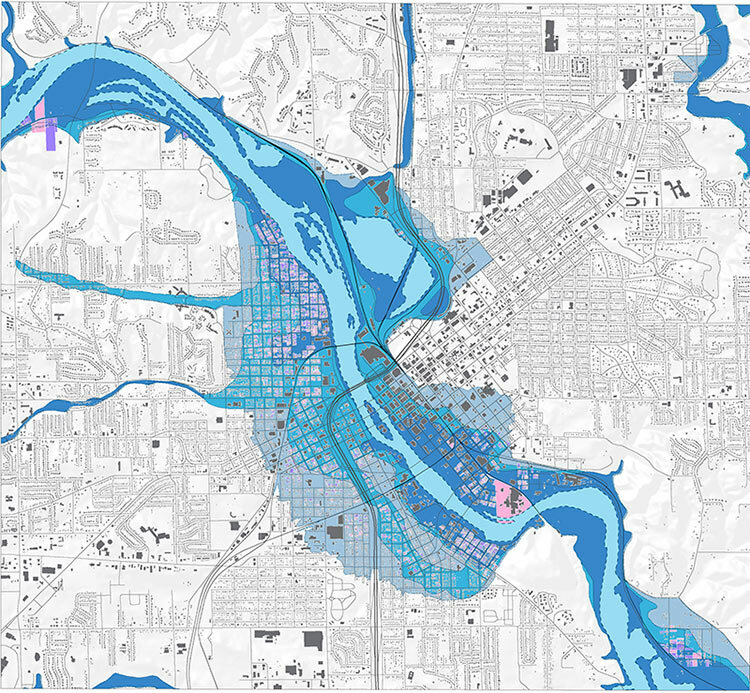 Sasaki Associates’ plan for Cedar Rapids integrates flood protection infrastructure into the landscape. In addition to material infrastructure, Sasaki Associates’ plan for Cedar Rapids includes communication networks across the watershed region. 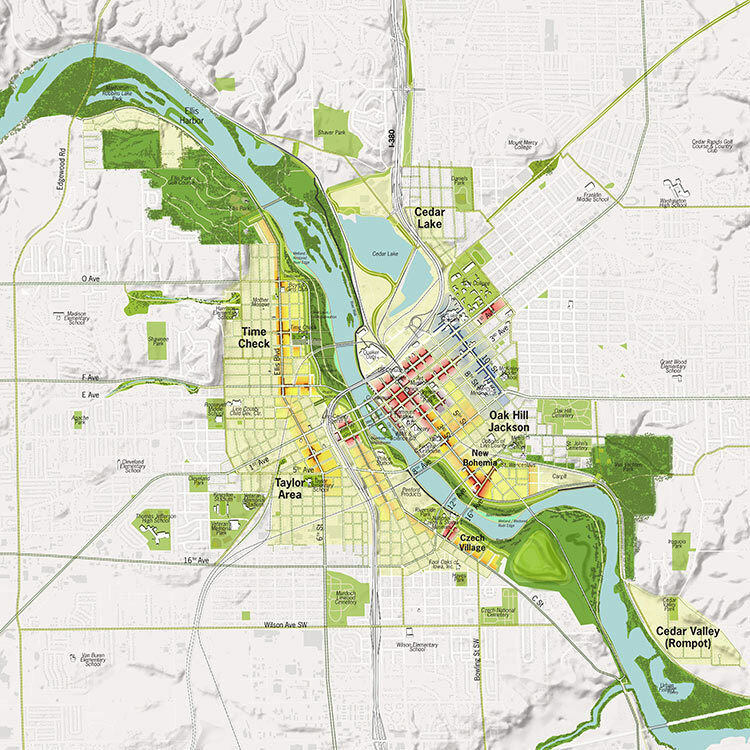 This was a lesson learned the hard way by Cedar Rapids, Iowa, when, in 2008, the Cedar River flooded, causing extensive damage across the city from floodwaters that crested over 30 feet. The Boston-based planning and design firm Sasaki developed a multi-phase redevelopment plan aimed not only at recovery, but also at preventing the kind of devastation seen in 2008. “Our focus was on understanding the relationship of the community with the natural environment,” explained Sasaki principal Jason Hellendrung, which meant treating the site not as a defined, physical entity, but rather as a diverse community of people within a watershed region. 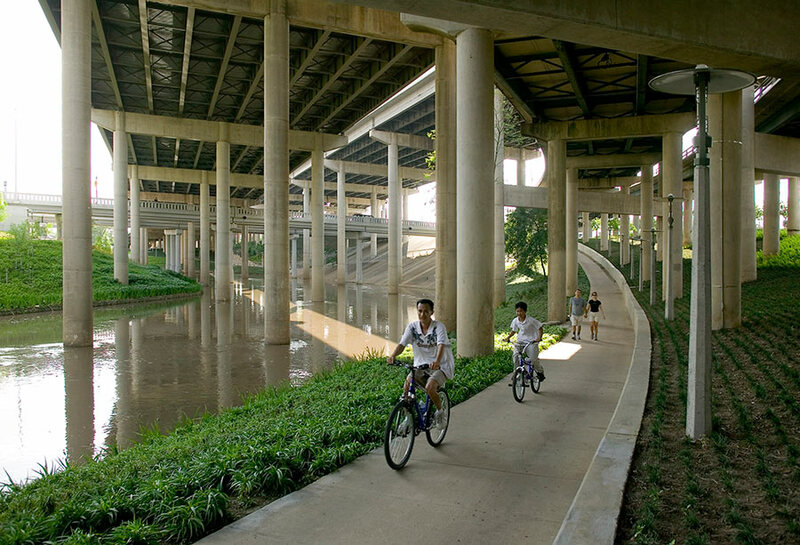 “By now, it’s pretty clearly understood that hard systems can fail,” said Hellendrung, so by calling for a 220-acre greenway along the river that incorporates infrastructure ranging from hard to soft, Sasaki designed the kind of overlapping systems that resilience demands. The project also highlights the need to consider interventions beyond the material. For months, Sasaki worked closely with community members and organizations to tailor its response to Cedar Rapids. And part of the redevelopment plan that ensued includes communication networks for flood warnings and plans to cooperate more closely with municipalities across the watershed region. 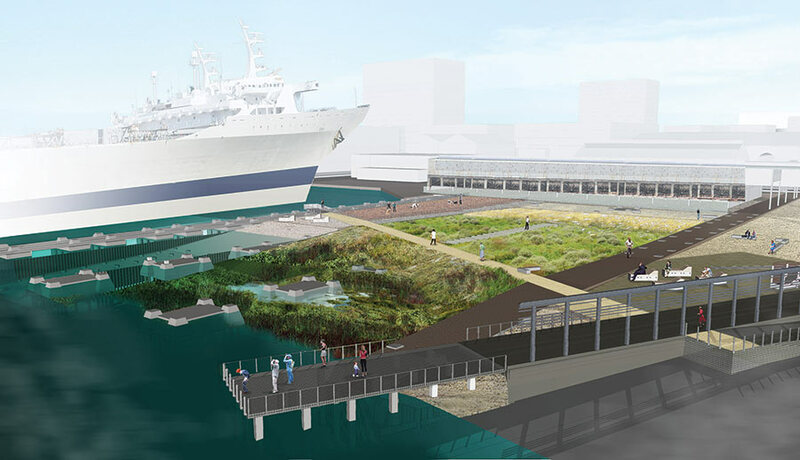 De Urbanisten’s Watersquare project in Rotterdam is a sunken urban plaza that doubles as a catchment system to manage stormwater. Watersquare in dry (left) and wet (right) conditions. The design includes plenty of grey. On the edge closest to the river, a concrete armor wall provides a hard barrier against pre-Sandy 100-year flood projections, while ribbons of precast concrete retaining walls offer second-, third-, and fourth-line defenses within the park itself, and concrete-paved walkways are fastened to the site. 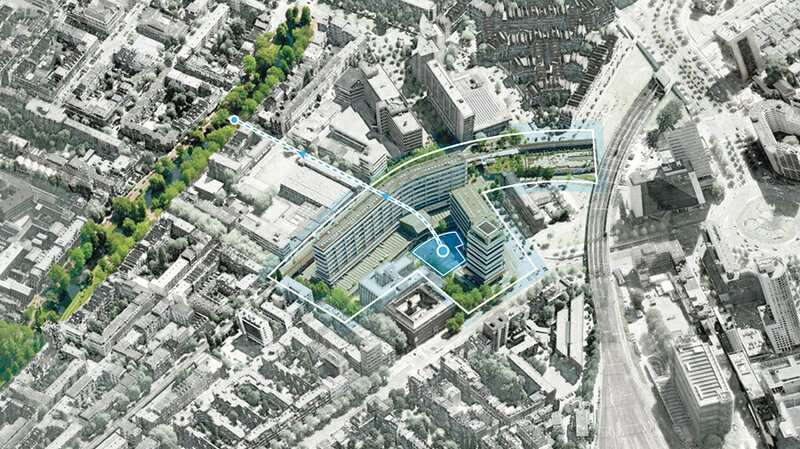 But the park’s section could double as a diagram for the so-called grey- and green-infrastructure integration. The broad promenade is divided into linear bands, a marbling of concrete walkways and planted strips. The retaining walls double as seating and also act to hem in raised planters. 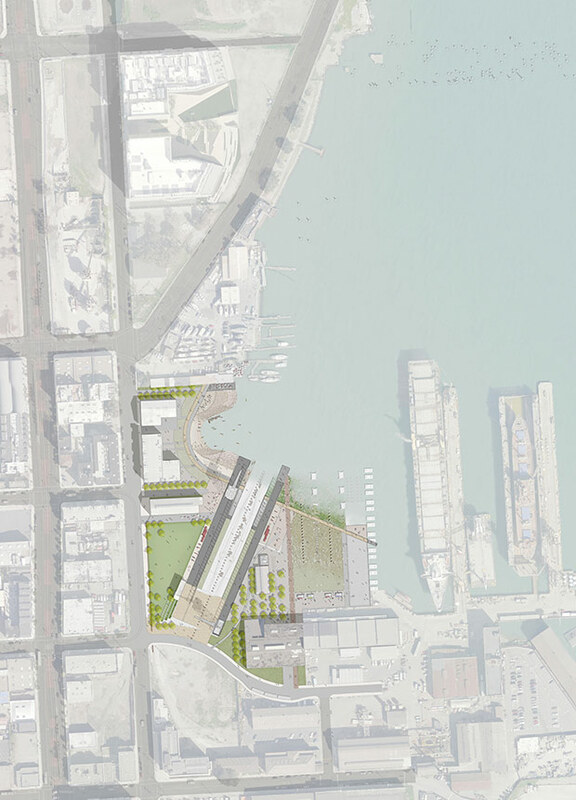 Not only do these bands allow the designers to hybridize green and grey into a cohesive system, they also make it possible to terrace the waterfront, leaving the edge along the adjacent community—and the vaults for the park’s electrical systems—well above the new 100-year flood levels. “Rather than thinking of this as a singular bulkhead—as a strict edge where water and land meet—we are proposing a series of terraces that can be inundated and flooded,” said Switkin. Rendering (top) and construction view (above) of De Urbanisten’s Watersquare project. AECOM’s Crane Cove Park in San Francisco is designed to flood, absorbing the brunt of a storm surge and protecting the populated area beyond. 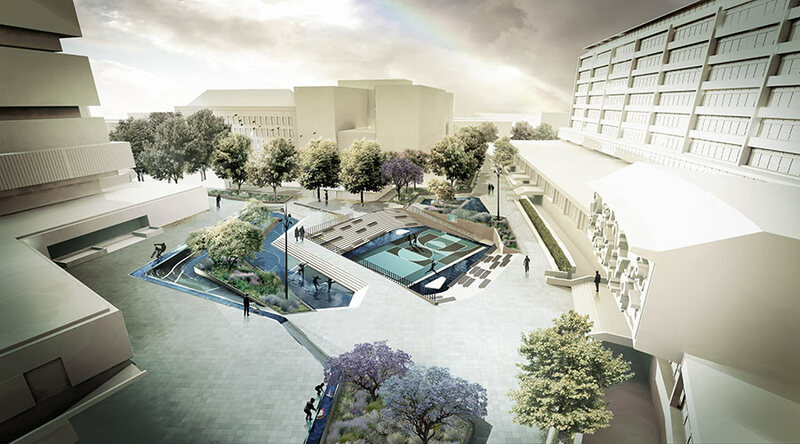 “People love water, so the challenge is to create these spaces that work as a safety measure, but also as places for people to enjoy,” she said, pointing to the de Urbanisten-designed Watersquare project, in Rotterdam, which creates a sunken urban plaza doubling as a catchment system to manage excess water in the event of flooding. Crane Cove Park seen in low tide (left) and during high tide (right). Any design for resilience needs to carefully manage public perceptions of safety. Levees are often faulted for creating a false sense of security (and justifying risky real estate development) while the promises made by soft systems in urban contexts needs to be more fully studied. “This is a discussion that needs nuance—and a lot of rigorous scientific research,” said Shanley. “If you’re talking about adding dunes as surge protection, and you’re looking at a surge of 10, 15, 20 feet, plus the wave action on top of that, dunes are like seaweed. All of the energy in this water is in the upper zones, so it’s going to just flow right over,” he said, citing undergoing research at Houston’s Center for Severe Storm Prediction, Education, and Evacuation from Disasters. Rather than beating the drums for a seawall or promising to save New York by going green, designers with organizations like these ought to be doubling down, with justified urgency, to understand exactly what those systems mean across given regions. James Corner Field Operations’ Greenpoint Waterfront Park acts as a frontline of defense against storm surge and as a public outdoor space. This kind of research-intensive design work is now being undertaken with Rebuild By Design, a competition sponsored by the U.S. Department of Housing and Urban Design (HUD), in collaboration with the Rockefeller Foundation, that aims, first, to undertake analyses of the entire Sandy-affected region, then to propose a range of design concepts on various scales that can be implemented by municipalities as needed. By organizing it in this way, HUD managed to cut across the types of partitions that would otherwise hamper resilience strategies. Teams, for example, include designers, planners, engineers, scientists, geographers, hydrologists, and policy experts. The scale of inquiry ranges from the building detail to entire ecosystems, sites can include dense urban areas and small communities, and, in an important step, it creates a jurisdictional venue that crosses state and city lines to treat the risk of storm surges as the regional issue that it is. The big objective for resilience design, regardless of risk, is to short-circuit the entire list of false dichotomies, beginning with hard and soft, but including river and watershed, shore and sea, urban and rural, and natural and built. This will require a radical reorientation in the way projects are designed and carried out. Disciplines will need to collaborate in unprecedented ways—not by making vapid claims to “interdisciplinarity,” but by assembling committed teams of scientists, engineers, economists, planners and designers. And political borders need to be understood not as boundaries, but as sites of sharing and exchange. There is a worrisome historical precedent to be found in the sustainability challenge popularized over the last decade. Though significant strides have been taken toward increasing energy efficiency in buildings and cities, many of the real possibilities for fundamental change have been hampered by the lure of a buzzword. Now is the time to imagine just what resilience can be, before it risks devolving into the kind prescribed solutions that can have such a stultifying effect on design. Before someone goes out to coin an acronym for resilience—LEED is taken, SEED, too, so REED seems a likely choice—let’s agree that the scope of resilience transcends any checklist, and it ought to be approached differently, in manner with the projects above. More than six months after Hurricane Sandy swept through New York City, homeowners are still struggling with the aftermath of the storm. To help with the recovery efforts, the New York City Department of Housing Preservation and Development (HPD) has issued a Request for Qualification looking for developers to rebuild one- to four-unit homes in the city that were damaged by the storm. Funding for the effort will come from Community Development Block Grant Disaster Recovery money, and all projects must meet the requirements of the U.S. Department of Housing and Urban Development. The deadline for proposals is June 5, 2013. Northwest Indiana’s 2040 masterplan took home top honors for comprehensive planning last week, when the American Planning Association handed out its 2013 National Planning Excellence Awards. The association also saluted 12 projects with the first-ever National Planning Achievement Awards. Tying into a major theme at this year’s conference, the APA award winners tended toward projects with an ambitious scope, such as Philadelphia’s sweeping planning and zoning rewrite and New York’s Zone Green initiative. 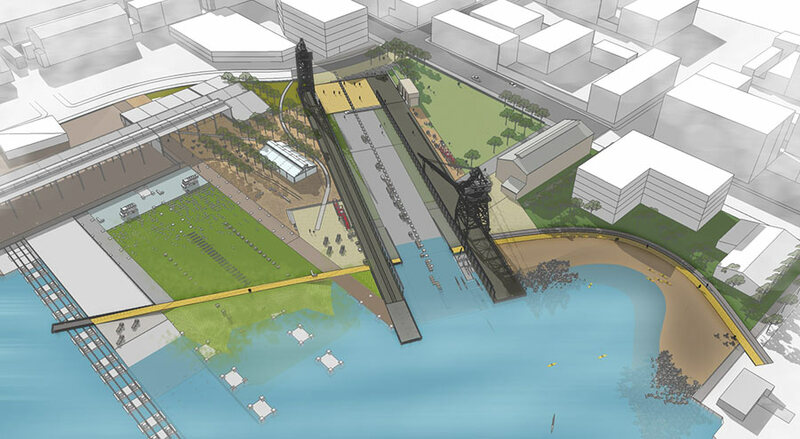 Cincinnati’s riverfront development, The Banks, won the implementation award, winning praise for its resurrection of an area cut off from downtown by an expressway since the 1950s. Since then the city’s population has dropped 41 percent. But after a low point in 2002 when the mayor abolished the planning department, Cincinnati is in the midst of a “rebirth,” according to city planners there. “How do we modernize our city without suburbanizing it?” asked Katherine Keough-Jurs, a senior city planner with Cincinnati. She was speaking at a panel on the resurgence of urban planning in the city. “Maybe what makes our city great is what we strayed away from. Let’s look back to that.” Bridging the expressway that once severed downtown from what is now, The Banks was one key example. The city is also developing a form-based code, targeted to areas where walkable communities still thrive. The goal is to keep planners from trying to start a new neighborhood center where it would compete with an existing one. Michael Osur, Deputy Director of the Riverside County, California Department of Public Health was selected for the National Planning Excellence Award for a Planning Advocate and Ronald Shiffman was named National Planning Award for a Planning Pioneer. Goody Clancy, Interface Studio, and the Chicago Metropolitan Agency for Planning were also awarded in the Planning Firm, Emerging Planning & Design Firm, and Planning Agency, respectively. 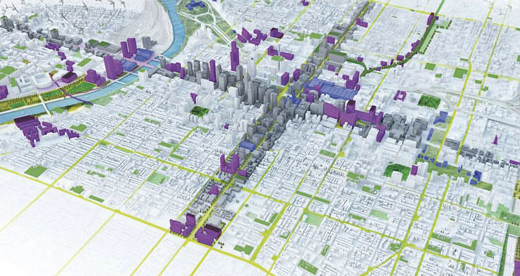 More National Planning Excellence Awards winners, from coast to coast, below. View the twelve winners of the National Planning Achievement Awards here. (All images courtesy APA.) National Planning Excellence Award for a Grassroots Initiative Cathedral City's Environmental Conservation Division (ECD) Kids & Community Program Cathedral City, California From the APA: "The Environmental Conservation Division (ECD) Kids & Community Program is an environmental education and awareness project where young people conceptualize, design, plan and create hands-on environmental projects that help reduce landfill waste and beautify the landscape of Cathedral City. The program's goals include making recycling and conservation fun, preserving the beauty of the local environment, and encouraging youth to play an active role in community efforts. It engages youth within the community and offers a way to learn about the environment while being part of the solution." The HUD Secretary's Opportunity & Empowerment Award Restoring the American City: Augusta's Laney Walker/Bethlehem Augusta, Georgia From the APA: "The Laney Walker/Bethlehem Revitalization Initiative involves two historic African American neighborhoods and is a pioneering effort to reverse decades of blight and disinvestment and regenerate nearly 1,100 acres of Augusta's urban center. This decision to catalyze regeneration of Augusta's urban core was primarily driven by politics and the need to address a historically disenfranchised population. The project addresses a number of needs and community objectives outlined in the Augusta-Richmond County Comprehensive Plan, including affordable housing, access to jobs and services, open space, blight abatement, infill development, and preservation of local heritage." Daniel Burnham Award for a Comprehensive Plan 2040 Comprehensive Regional Plan: A Vision for Northwest Indiana Lake, Porter and LaPorte Counties, Indiana From the APA: "The Northwestern Indiana Regional Planning Commission's (NIRPC) 2040 Comprehensive Regional Plan (CRP) represents the first broad planning initiative covering the counties of Lake, Porter and LaPorte. The CRP focuses on a variety of issues including transportation, land use, human and economic resources, and environmental policy objectives. The objective is to offer residents more transportation choices, and making the cities more sustainable and livable." The Pierre L'Enfant International Planning Award The Valsequillo Initiative Puebla, Mexico From the APA: "The Valsequillo Initiative is a planning effort not only to improve the quality of urban areas growing around the Valsequillo Reservoir and increase opportunities for area residents and remediate decades of environmental degradation, but it also aimed to unify urban and environmental planning for the first time. Four years ago, the 58,000-acre Valsequillo region was set to become a new mega-development, a companion city to Puebla, Mexico's fourth largest urban area. Development proposals would have reduced the value of the area's ecological resources and displaced indigenous communities, small farmers, and communal landholders." National Planning Excellence Award for Urban Design Lancaster Central Market: Assessments, Guidelines, and Recommendations for Preservation and Development Lancaster, Pennsylvania From the APA: "The Lancaster Central Market: Assessments, Guidelines, and Recommendations for Preservation and Development guidelines was created after a comprehensive study of the Lancaster Central Market that connected the importance of architectural preservation, urban development history, and cultural heritage, to present planning and development decisions. The Central Market is on the National Register of Historic Places and was named by APA as one of the Great Public Spaces in America. The study of the Central Market that resulted in the planning guidelines was a regional first, producing a historical-architectural report to guide building renovations, before decisions were made for a capital improvement project." National Planning Excellence Award for Environmental Planning NYC Department of City Planning, Zone Green New York, New York From the APA: "Zone Green is an initiative to modernize regulations for greener buildings. It is a coordinated package of zoning amendments, city legislation, and state legislation that promotes the construction and retrofitting of greener buildings. The regulatory changes adopted through Zone Green affect all categories of buildings throughout New York City, from single-family detached homes to high-density office buildings. It also gives owners and builders more choices for investments to save energy, save money, and improve environmental performance." National Planning Excellence Award for Transportation StarMetro's Route Decentralization Tallahassee, Florida From the APA: "For years, StarMetro operated a hub-and-spoke transit system that brought all passengers to one central transfer location downtown. Riders were forced to unnecessarily travel through the central business district to get to work, resulting in extended commutes and overcrowding. A survey revealed that 93 percent of passengers were traveling somewhere other than downtown. StarMetro was tasked with decentralizing all routes at the same time, within its normal operating budget." 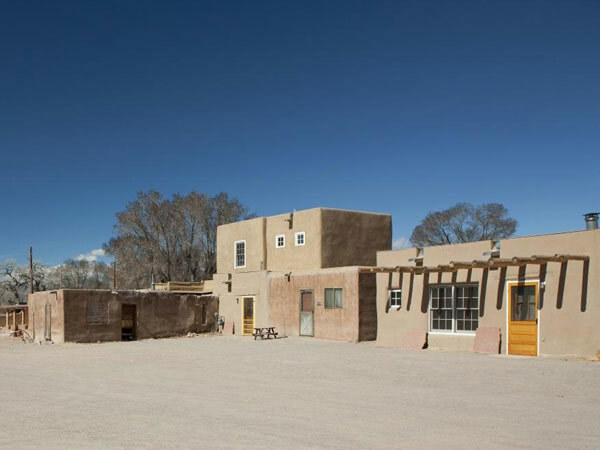 The HUD Secretary's Opportunity and Empowerment Award Owe'neh Bupingeh Preservation Plan Ohkay Owingeh, New Mexico From the APA: "Ohkay Owingeh is the first Pueblo tribe to develop a comprehensive preservation plan that guides practical housing improvements according to cultural values. The Owe'neh Bupingeh Rehabilitation Project is a multi-year, affordable housing, rehabilitation project within the historic core of the tribe's village center. Only 60 homes remain of the nearly several hundred that once existed. Most had been abandoned by 2005 due to deterioration." National Planning Excellence Award for a Best Practice Philadelphia's Integrated Planning and Zoning Process Philadelphia, Pennsylvania From the APA: "The Philadelphia City Planning Commission's (PCPC) integrated Planning and Zoning Process is an innovative approach to leveraging the synergy between citizen education, planning, and zoning reform. 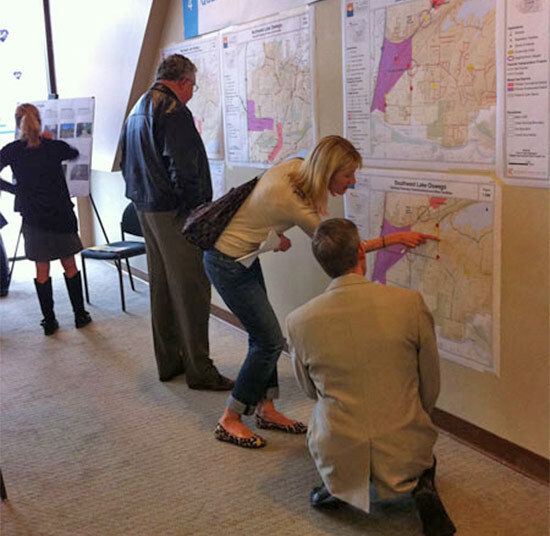 The PCPC coordinated three distinct planning activities — the Citizens Planning Institute (CPI), Philadelphia2035 (the city's comprehensive plan) and a new zoning code and map revision. Individually, these activities educated hundreds of citizens and professionals, and engaged thousands in envisioning the future of Philadelphia and improving the way development is regulated. Collectively, they created an environment that hadn't existed for 50 years. The city not only adopted a new comprehensive plan and zoning code, but did so in the same year and has moved forward with implementation." National Planning Excellence Award for a Communications Initiative We Love Lake Oswego Video City of Lake Oswego, Oregon From the APA: "The City of Lake Oswego created the "We Love Lake Oswego" video as part of its public outreach effort to educate and engage the community in the comprehensive planning process. The video objectives were to convey a compelling story about why to plan for the future, provide a clear, concise concept of what the comprehensive plan update is about, and offer inspiration for the community to participate in the planning process." National Planning Excellence Award for Public Outreach Newberg 6th Grade Design Star Program Newberg, Oregon From the APA: "The Design Star Program is a learning collaboration between the City of Newberg and local 6th grade students that has engaged students in city planning. The program started as part of the city's outreach efforts during National Community Planning Month and is now an annual collaboration between Newberg city staff and middle school teachers and has been integrated into the curriculum. The program teaches students about why things are organized a certain way in their city, and it allows them to think critically about both the positive and negative impacts of development, the need for jobs in the community, how to differentiate between city wants and city needs, as well as environmental impacts of commuting for jobs and recreation. It also teaches students mapping, writing, presentation, and teamwork skills." Advancing Diversity & Social Change in Honor of Paul Davidoff YWCA Central Alabama Birmingham, Alabama From the APA: "The YWCA Central Alabama undertook a multimillion-dollar urban neighborhood revitalization effort called YWoodlawn. 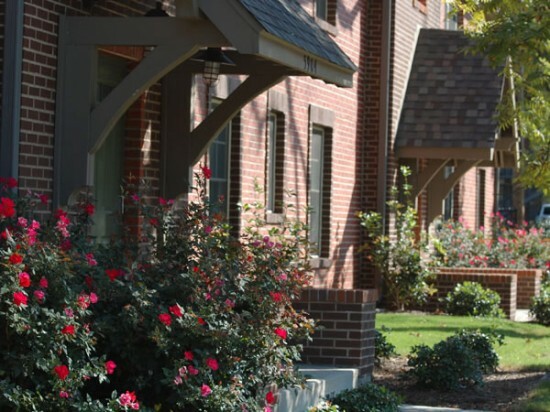 The YWoodlawn Plan was a collaborative empowerment initiative intended to reduce poverty and hopelessness within an underserved area of Birmingham through reinvesting in the neighborhood; providing innovative housing for families experiencing homelessness; introducing affordable transition housing for families; bringing health, education, and employment-based services to the community's doorstep; and reintroducing homeownership opportunities in a stable, growing community." 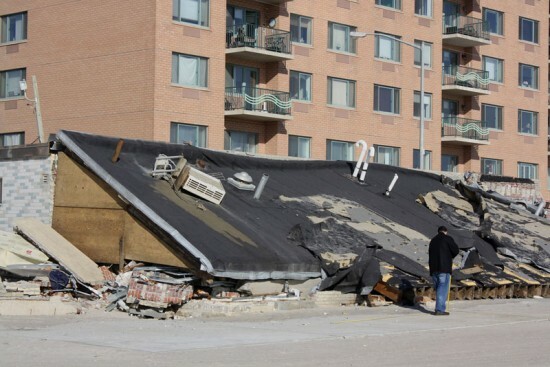 Hurricane Sandy not only caused considerable damage to the Rockaways, but it also exposed the vulnerability of New York City’s waterfront communities to future storms and changing weather patterns. Today, the American Institute of Architects New York, along with NYC Department of Housing Preservation & Development, L+M Development Partners, Bluestone Organization, Triangle Equities, and Enterprise Community Partners, announced a new design competition for "resilient and sustainable development in the Rockaways." The group called on architects to come up with different strategies for how cities can build more thoughtfully in areas prone to flooding. Following the June 14th deadline for submissions, a jury will preside over the proposals. The jury will announce four finalists in July—each of which will receive a stipend of $30,000 to continue to hone their ideas. The winner will be revealed on the one-year anniversary of Hurricane Sandy, and will be granted an additional $30,000 for their work. The Rockaways have been the focus of a number of competitions, including MoMA PS 1's EXPO 1: NEW YORK, that asked artists, designers, and architects to submit 3-minute videos that provide ideas for making the Rockaways more sustainable.